Dr. Chance W. Lewis, founding executive director of the Urban Education Collaborative and the Carol Grotnes Belk Distinguished Full Professor of Urban Education at the University of North Carolina Charlotte speaks to the 500 participants who gathered at the International Conference on Urban Education. MONTEGO BAY, JAMAICA ― By the end of the two-day International Conference on Urban Education, business cards were being swapped from hand to hand, and firm commitments were being made to reach across international borders to find ways to conduct new research and collaborate on future projects. 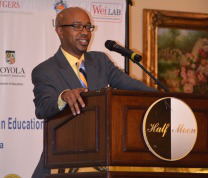 While a slew of scholarly organizations committed to education research have long existed in the United States, the study of urban education has largely remained on the periphery, according to many of the 500 university professors and administrators, community activists, government officials, and high school teachers and principals who converged on this Caribbean island to explore the topic. Now, they’ve argued, is the time for a new conversation focused exclusively on some of the challenges that beset urban education, not just in the United States, but indeed across the globe as demographics continue to shift. And they see the International Conference on Urban Education — a biennial event — organized by the Urban Education Collaborative at the University of North Carolina at Charlotte, as the right vehicle to help bring about real reform. At a time when many politicians in the United States have all but given up on urban schools, university scholars spent several days engaged in deep conversations with school practitioners about how to make their research, which, in many cases, centers on minority children, more accessible to the masses. There were workshops about the school-to-prison pipeline, the challenges facing Black males and females, and the role that school counselors can play in helping children and their families access critical services. Ten high school students from West Charlotte were invited to travel to Jamaica and present their research after a year of attending monthly Saturday sessions organized by the Urban Collaborative. Their school is located in one of the city’s most troubling urban centers. For many of them, it was their first opportunity traveling outside of Charlotte on an airplane. The experience of personally engaging with Ph.D.s increased their interest in attending college and graduate school. During her keynote address, Dr. Gloria Ladson-Billings, the Kellner Family Chair in Urban Education at the University of Wisconsin–Madison, told participants that hip-hop can also be an effective teaching tool in helping scores of “New Century students” succeed. That strategy, she said, requires that teachers and school administrators rethink traditional methods of instruction. Thinking outside of the box was a major theme of the conference, as participants agreed that there was no one panacea for turning troubled schools around. The challenges, they said, had to be attacked from a variety of fronts. The conference organizer, Dr. Chance W. Lewis, founding executive director of the Urban Education Collaborative and the Carol Grotnes Belk Distinguished Full Professor of Urban Education at UNC Charlotte said that individuals came to the gathering with a desire to drill down deeper in finding practical solutions. “The academics don’t have all the answers,” he said, adding that it was important that other stakeholders also be invited to the table and that scholars be encouraged to seek out opportunities to publish and disseminate their work widely, including on social media. While the study of urban education has gained some traction in recent years — in part because of the groundbreaking work of Lewis, Ladson-Billings and Dr. Pedro Noguera of New York University who delivered the opening keynote address ― it continues to lag far behind other education concentrations. Lewis said that in the United States, only 10 universities currently offer Ph.D. programs with a specific focus on urban education. Those kinds of partnerships make sense to Dr. Ellen McIntyre, dean of the College of Education at UNC Charlotte.